Highlighting Our Variety of Prototype Casting Services | Protocast Inc. In posts of the past, we’ve tackled a variety of topics. From interesting shapes you probably didn’t know the names of to gift ideas for the mechanic or inventor in your life, it’s safe to say we’ve covered a broad range of categories, with some of them relating more closely to our magnesium casting, zinc casting, stainless steel casting, and general prototype casting services than others. That being said, we’re gonna gather ourselves and return to home base, as it were, in today’s post. Given the fact that you’ve arrived at this blog post, our powers of deduction lead us to believe you are at least vaguely interested in learning more about our foundry of sorts. That’s why we’ll take the time to highlight our variety of prototype casting services. From prototype to production, we specialize in zinc, magnesium, aluminum cast in addition to CNC machined parts for aerospace, defense, medical, robotics, oil and gas, and automotive industries. If you are more the visual and less the reading-type, you can watch our video for a brief synopsis of our company and its utility. If, however, you enjoy the written word and are interested in getting a more detailed picture of our clean and efficient manufacturing company, by all means, read on. First and foremost, let’s talk about location. We are located in Denver, Colorado. We were founded in 1995 with little more than a humble, 2,000 sq ft. shop at our disposal. Kevin Fortin and Mike Kaiser founded Protocast Inc. on speed and 3D printing technology. We created molds with urethane, silicon, and SLAs, using tooling from the 3D pattern. After this, we’d create the plaster molds, with the metal then being poured into the plaster mold to make the casting. Over the years, we grew in size and in scope of service. In 1998, we moved to a larger shop in Northglenn, a suburb of Denver. We then added a variety of processes as a company and our business developed and technology improved. We added CNC machining in 2002, sand casting in 2005, investment casting in 2008, we added the ability to heat treat casting in-house in 2013, and in 2014, we bought a HAAS gantry-style CNC mill for cutting tools. In 2015, we dramatically expanded the sand casting line, which led us to move from low-quantity to high-quantity production lines, while still maintaining our trademark quality. We’ll get to our range of services in just a moment, don’t worry, but before we get too far into the weeds here, we might as well explain when and why you would use Protocast Inc. Here at Protocast Inc., we offer rapid prototype to production castings for a range of industries, with a unique specialty in non-ferrous alloys. Non-ferrous alloys and metals, in case you were wondering, are metals that do not contain iron. That is, there might be trace amounts of iron in a given metal, but not enough to affect anything, if that makes sense. Non-ferrous metals are used because they are usually low in weight (like aluminum), have higher conductivity (like copper), or an alloy might be resistant to corrosion, like zinc. If you are confused by one — or several — of the items on the above list, don’t worry. We’ll have a dedicated “Casting 101” post in the near future. But for the purposes of today, we think you’ll find the description of our services to be illuminating. Here’s a fun fact for you, which you might also find useful: almost half of our employees have degrees in engineering. We provide engineering support in a variety of ways, from feedback on machining and casting to reverse engineering, 3D CAD modeling, and finite element analysis, we are able to provide consultative engineering services which can support projects of most any scope. We offer CNC machining services. To the unfamiliar, CNC stands for computer numerical control, which is essentially the automation of machine tools via computers performing designated sequences of machine control commands. Is that clear? No? Sorry. It’s kind of complex. But the most important element of our machined parts services has to do with the fact that we can help people looking for services that involve cutting a part from stock. Sometimes it’s the only (or the most cost-effective) way to produce a part. 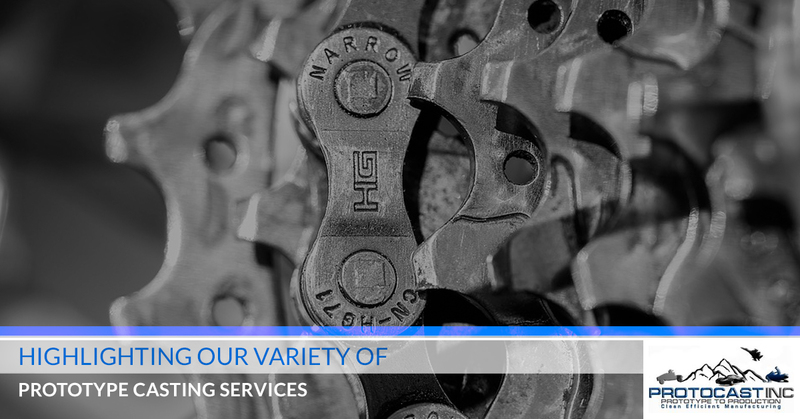 Luckily, we have a full-line machine shop, complete with operators and engineers who work in tandem to produce top-line parts according to our customers’ specifications. As part of our prototype-to-production services, we offer in-house inspections which can handle most dimensional requests. With our in-house CMM, a coordinate measuring machine used for measuring the geometrical characteristics of a given object, we are more than capable of most anything our customers request. What’s more, we also are experienced in customer-defined pressure and leak tests. That may or may not relate to the project you have in mind, but it might prove to be useful down the road. On top of that, we have connections, so we can send out parts for dye penetrant, tensile test bars, x-ray, and other ad hoc testing services. The last service we’d like to highlight in today’s post is our part modification service. You might find yourself in need of updating a part, otherwise it might become obsolete or ineffective. 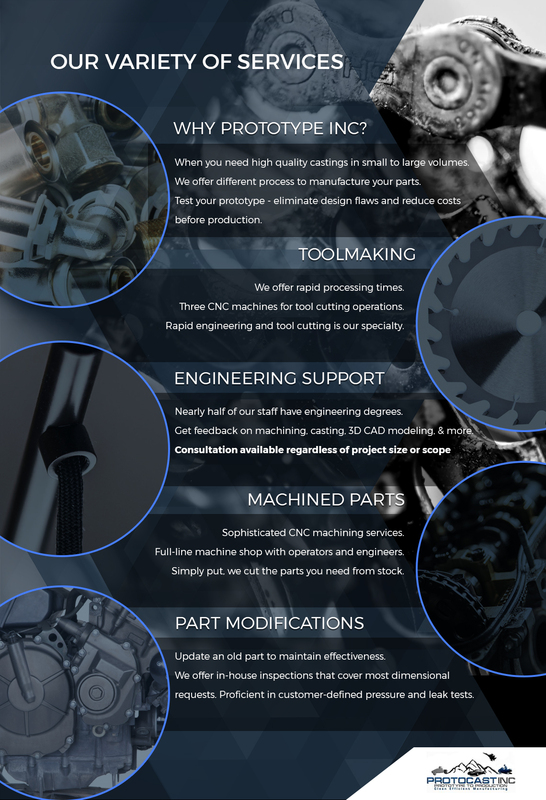 We are a partner who can reproduce the part as you need it, repair old tooling, modify current tooling, or essentially do whatever you need us to! So there you have it, a semi-detailed outline of our services. But before you think you have a full grasp on all that we do here at Protocast Inc., we’d like to point out that we have a variety of processes and alloys which we have yet to discuss (at least, at any point recently). If you are interested in Rubber Plaster Mold Casting, Machining, Die Casting, Aluminum Heat Treatment, or learning about our various alloys and common applications thereof, look out for future posts. In the meantime, give us a call to get this partnership started!